Let's face it - your ordinary run-of-the-mill flyers tend to look all alike. Sometimes, you need a little extra. This is why you need to look for flyer printing services that give you more customization options for sizes, stocks, coatings, and die-cut shapes. Fortunately, the interesting shapes and rounded edges on our die-cut flyers provide a hint of class and a way for your materials to stand out! Matte or glossy flyers make excellent promotional tools. Trade shows, product and event promotions, and invites are just some of their more common uses. 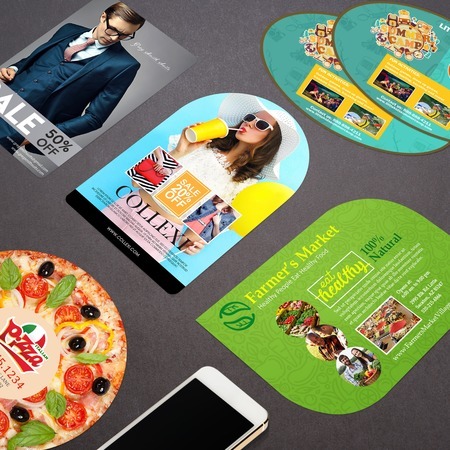 Most of our die-cut flyers come in the standard 4x6" size, except for the circle which has a circumference 4"; choose from three durable card stocks and order in quantities of 250 to 100,000. We use 28" Komori offset presses for color flyer printing, ensuring your first prints look consistent! For online flyer printing, the standard turnaround is 3 business days, shipping time not included. Place orders in advance to avoid additional expenses!